Ginseng is used for making medicine that provides effective treatment for cases of stress, boosting immune system. Also working as general tonic and stimulant, it helps in lowering of blood sugar in people with type 2 diabetes as well as also prevents issues related to respiratory tract infections like cold or influenza. Widely used thousands of formulas to provide vivacity and energy, Ginseng Roots has been used for over 5, 000 years. In Qing Dynasty of ancient China, this herb was worth more than gold. Effective in boosting immunity, the herb contains nitrogenous compounds, minerals, vitamins, fat-soluble compounds and carbohydrate compounds. The plant takes six years to reach the period of maturity. 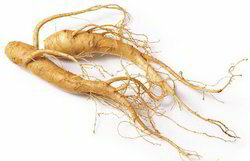 We can Supply Ginseng Root from stocks at most competitive price.